This past weekend, I visited Italy. Yes, I live in Rome. Yes, Rome is in Italy. Yes, I know that makes the first statement of this post redundant. But what I mean is: Rome is an entity in and of itself. Like New York City or London or other self-contained worlds of hoards of people and mega attractions, Rome (without the type A personality of NYC or London) feels like its own country. So it is nice to leave Rome on the weekends to visit Italy, the Italy beyond the Aurelian walls and the GRA. Italy has a lot of other personalities as well: the winter snowy skiing side, the summery beach-bum lounging side, the small town/farmer harvesting side, the Florence Uffizi art-inspiring side, the Milan runway-walking business-making side... these are some of the many facets of "Italian" life. Probably the one I love above them all is the rolling hills, agriculture growing, medieval town hosting country- side. I often crave the expanse of undulating land punctuated with cypress trees, dotted with sunflowers and indented with long curving driveways of agriturismi (farmhouses). It is amazing. And I never get sick of it. I have been to Tuscany and Umbria so many times that I forget exactly where I have been; all the beautifully small, walled towns meld together into one lovely memory. I have often ended up in the main piazza of one of these towns and suddenly exclaimed, "Wait a second, I have been here before!" No matter. It is always nice to be there again. Orvieto is a city I have been to countless times, and unlike some cities that fall into the black hole of my mind, I remember all the countless time I have been to Orvieto. I still love to go back to this noble but unassuming town high on the top of an Umbrian hill. We have lately found the perfect spot for gazing at this gentle and lovely city, the Cioccoleta agriturismo. I have mentioned this place once before in a past post you may remember; we had discovered it this past September as a desperate attempt to save a weekend-turned-wrong. This discovery was the surprisingly sweet lemonade after the gift of a lemon. From the agriturismo's owners to the cats on its grounds, I love this place. Calm, picturesque a bit undiscovered, it is everything I like about the Italian countryside. And it is a perfect place from which to discover other towns, to stop into cantine (e.g. Orvieto classico wineries in this area) and to see the unobstructed sky full of stars at night. It is wonderful. This trip to Italy, as it should, also included amazing food and wine. 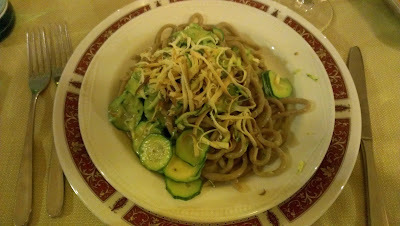 Most notably, I tried umbrichelli, a local, typical thicker spaghetti-type pasta, made of spelt. This particular version was served with zucchini and ricotta affumicata (smoked ricotta cheese). Angela, our host at the Cioccoletta, recommended trying this dish and I am glad she did. We drove on picturesque streets on the way back to Rome, saw the land change color with the setting of the sun and came back to a hushed Rome, quieted down after the rest of a Sunday. All in all, it reminded me how happy I am to be living in Rome: I get to visit Italy every weekend.